Time can bring many changes. Especially when the time includes wars between neighboring nations. Andres Pico is probably best known in San Diego history as the commander of the Californios against American troops at the Battle of San Pasqual, the bloodiest battle of the Mexican-American War. The battle is still re-enacted here every year and some controversy still swirls over who really won it and which army had the better leader, although most accounts give the edge to Pico. The battle may still be disputed but the war of course was won by the USA, bringing California under the American flag in 1848. And how many know what became of Andres Pico after that? 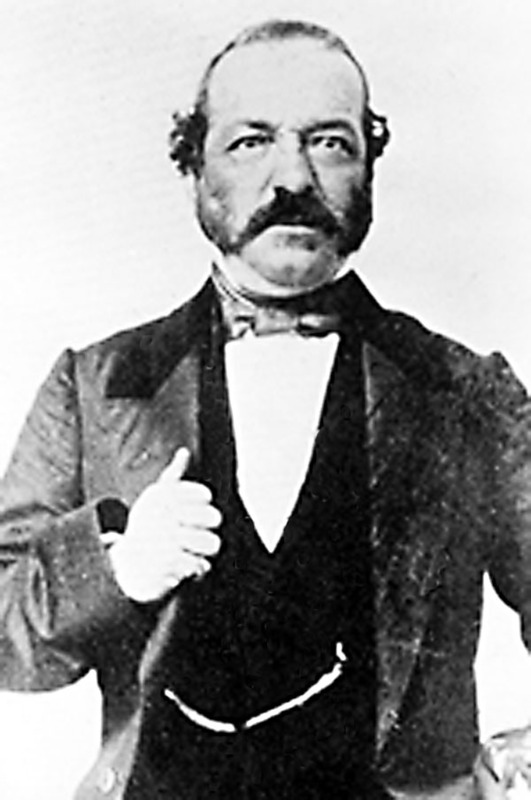 In 1849 Pico was among those selected as a delegate to the California Constitutional Convention. Two years later, in 1851, he won election to the state assembly. His old adversaries clearly recognized his military prowess, because in 1858 he was appointed a Brigadier General in the California State Militia. But Pico proved as adept at politics as he did on the battlefield. When the federal government moved to recruit a battalion of “Native Cavalry” from California for the Union Army, Pico was offered the command. Ill health forced him to turn it down, but he became an important recruiter and fundraiser for the unit which ultimately helped to prevent Confederate incursions into New Mexico and Arizona. When Andres Pico died in 1876 his funeral was described in the Los Angeles Herald as “one of the most imposing ever seen in this city,” with “fifty carriages and at least a hundred sincere mourners on foot” following his casket, and pall bearers that included the governor of California and the mayor of Los Angeles. Sources for this post included historic Los Angeles newspapers, the website of the San Fernando Valley Historical Society, the essay, “California Soldiers in the Civil War,” by Leo Kibby, from the California Historical Society Quarterly, and the book, The Decline of the Californios, by Leonard Pitt. Here’s some proof from the February 7, 1914 San Diego Union. It reported a planned mass meeting later that month of representatives to create a county farm bureau. In response to a new law creating a cooperative extension service under the Department of Agriculture, counties who organized farm bureaus would get local advisors, working with agricultural colleges (like the then new UC Davis), to provide advice on up-to-date farming methods. “Ranchers and fruit growers of Lemon Grove organized last night as a branch of the County Farm Bureau, which will co-operate with the promised farm advisor in the development of the back country,” began the article. On February 20 over 1,500 farmers, many with their families, showed up for morning and afternoon sessions to elect bureau officers and hear speakers such as two deans from the University of California’s Agriculture Program, Thomas Hunt and H.E. Van Norman (the latter also a president of the National Dairy Association), and B. H. Crocheron, state leader of the new agricultural extension program. Yes, there was a time when traffic jams on the Poway Grade consisted of livestock rather than cars. 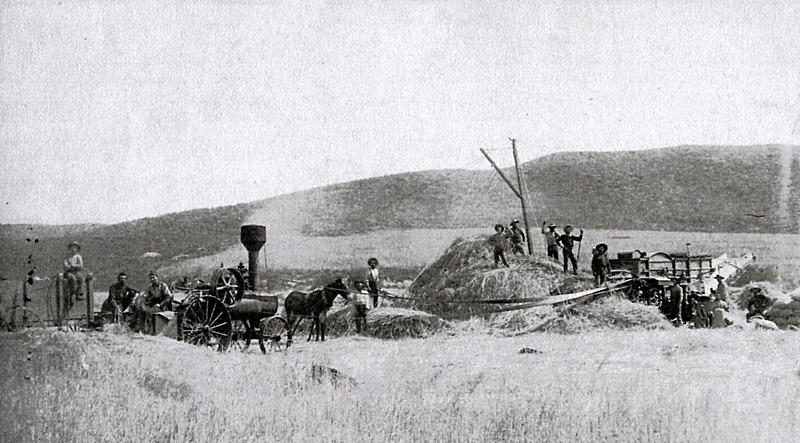 In an earlier entry I wrote about Andy Kirkham, a hard working farmer who was also an amateur historian and chronicler of his community, Poway Valley from the late 19th to the mid-20th centuries. He kept journals throughout his life which he later compiled into manuscripts donated to the archives of the Poway Historical and Memorial Society. One of those journals described the time in 1898 when 14-year-old Andy joined his father and brother clearing the Poway Grade’s road bed of loose rocks in the wake of a large flock of sheep. The flocks consisted of anywhere from 500 to 1,000 head, according to Kirkham. And it wasn’t just sheep. There were horse and cattle drives of similar size as well, and Sylvester Mendenhall, who ranched on Palomar Mountain, “would drive hogs on foot to the slaughter yard at Old Town,” wrote Andy. Kirkham also participated in some of those drives. He described an annual cattle drive from the Poway Valley “to the slaughter yard on the mud flats between old San Diego and the San Diego Bay.” A butcher would come from the city, “spending three or four days, going from one ranch to the other picking out the animals he wanted delivered” down to the yard. It took two days to get all the cattle in one corral. Then, starting out just before dawn, the ranchers would begin driving the cows toward the city. The biggest construction job in San Diego’s history–the Kearny Mesa housing project for defense workers and their families–was contracted for yesterday when the federal works administration awarded a $9,070,000 contract for 3,000 residential units. They called it the “Blitz Boom,” a term coined by the Saturday Evening Post to describe the surge in defense production in San Diego in 1940. War was raging in Europe. While the United States wasn’t officially involved, Washington had declared a “limited national emergency” in September 1939, calling for “strengthening our national defense within the limits of peacetime authorizations.” At the same time, U.S. defense companies were getting big orders for material from nations fighting the Axis powers, like Great Britain. How much business were they getting? The September 24, 1940 San Diego Union reported that the total backlog of orders for Ryan Aeronautical and Consolidated Aircraft exceeded the total assessed real estate value for the whole county of San Diego ($231.5 million vs. $221.4 million)! The production boom of course meant a jobs boom, triggering an enormous migration from across the country to the city of San Diego. Plans for the housing project on Kearney Mesa, whose builders promised “3000 houses in 300 days,” was one of the results. Today we know this community as Linda Vista. The city didn’t have enough housing even for the people it needed to build the housing. 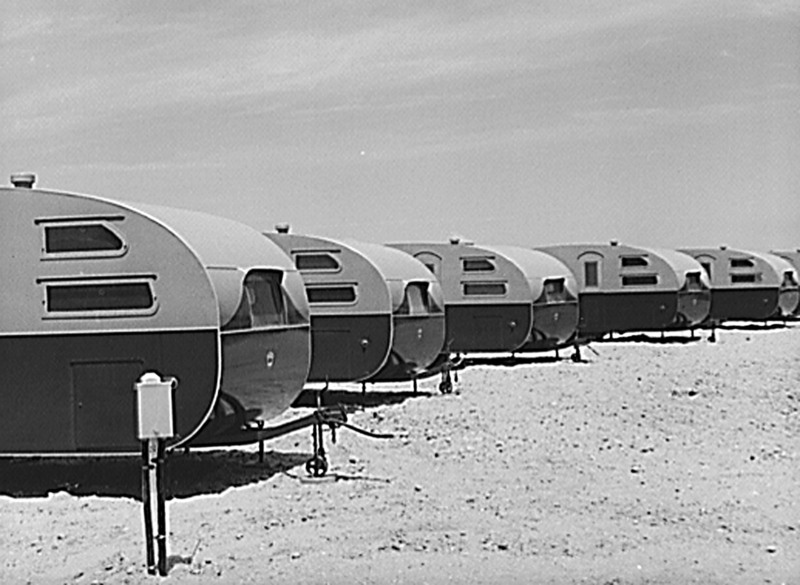 So “defense dormitories” and trailer parks sprouted up in places like the formally rural Mission Valley. 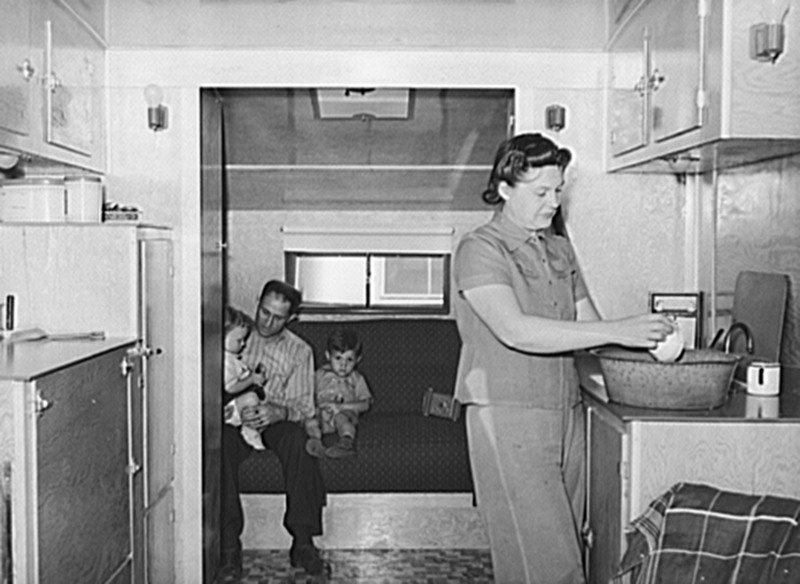 By May, 1941, it was reported that there were 1,500 people moving into San Diego each day. And this was seven months before Pearl Harbor. It was the beginning of a profound change for San Diego City and County. Sources for this post included historic San Diego newspapers, the Journal of San Diego History and the photo archive of the Library of Congress.